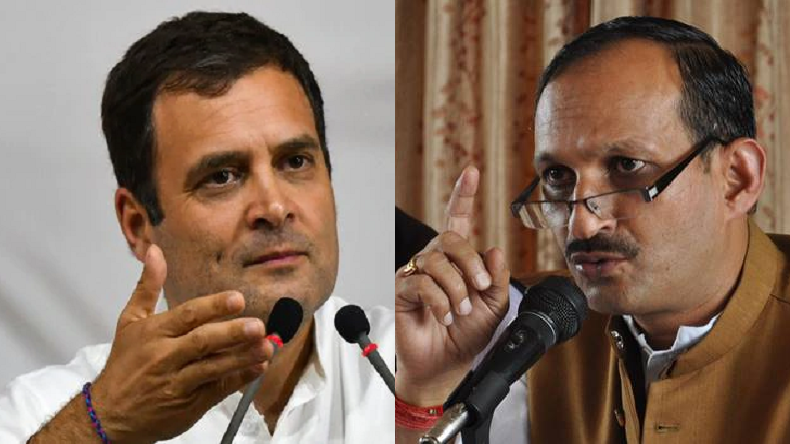 Himachal BJP chief Satyapal Singh Satti abuses Rahul Gandhi over chowkidar hi chor hai remark: The BJP chief of Himachal Pradesh Satpal Singh Satti used inappropriate words against the Congress president Rahul Gandhi. The BJP CHief of Himachal Pradesh can be witnessed saying that if PM is a thief then Rahul Gandhi is m********. Himachal BJP chief Satyapal Singh Satti abuses Rahul Gandhi over chowkidar hi chor hai remark: Himachal Pradesh BJP chief Satpal Singh Satti abused Congres president Rahul Gandhi at a party rally in Baddi town of the state. Baddi is part of the Shimla Lok Sabha constituency. Attacking Congress president Rahul Gandhi for his comment chowkidar chor hai in a direct reference to PM Narendra Modi, Satti said the Congress first family is out on bail yet the Congress chief called the PM a chor. Losing his perspective and crossing limits of all public decency, the BJP Himachal chief can be heard saying if the PM is a thief then Rahul Gandhi is a m********. Satti prefaced his insult at Rahul Gandhi by saying a Punjabi man had asked him to convey the same. The video has since gone viral and one can hear the Himachal BJP chief lose all control over political decency. Following Satti’s verbal assault and abuse, the Congress sought an apology from him, failing which they will register an official complaint with the Election Commission. Himachal Pradesh Congress chief Kuldeep Rathore said they didn’t expect such a crass comment against their leader from someone of Satti’s stature. The Lok Sabha 2019 campaign has been replete with leaders calling each other names. Yesterday Samajwadi Party Rampur candidate and party strongman Azam Khan had remarked on the inner wear of his rival Jaya Prada who had recently shifted her political allegiances from the Samajwadi Party to the BJP. While Jaya Prada has made an emotional response against the comment by Khan, the EC has sought a reply from the chief electoral officer of UP. The Congress has said the PM himself uses the chowkidar tag on his twitter account and many BJP supporters and sympathisers also sport the tag. Given this identification of the word with the PM, the Congress has attacked Modi for irregularities in the Rafale deal which has gone against the state-owned HAL and led to the profiteering of an Anil Ambani owned firm.